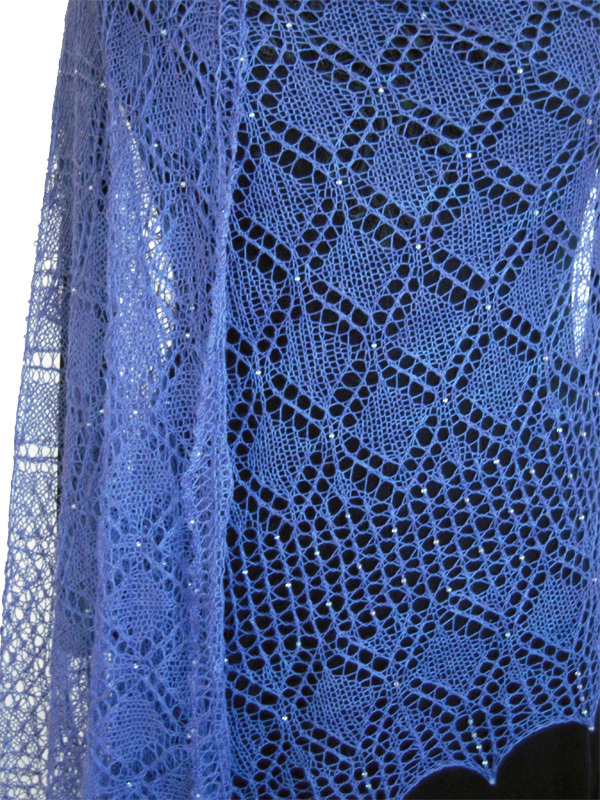 When I originally saw Nancy Bush’s Knitted Lace of Estonia I was smitten. The Crown Prince Square Shawl pictured on the cover is stunning. Taking a close look at the beautiful stars in the border I knew I had to do something with that stitch. I removed all the nupps and moved the motifs closer together, then modified it to use it as the central stitch. I found some tiny stars to separate the large stars from the border, and a shawl was born. Shawl is worked from a long provisional cast on at the top edge toward to lower border. Stitches are picked up from the provisional cast on, and bound off using the knitter’s choice of one of three methods. The pattern comes in three sizes: scarf, small shawl, and large shawl. Yarn: Lace weight, 375 [650, 825] yards. Model: Posh Yarn Cecilia in Iris; 1300 yards in 100 grams; 50% cashmere, 50% silk. Model knit in the largest size. Gauge: 14 sts and 28 rows to 4 inches in stitch pattern, blocked. Needles: US 5 (3.75 mm), 1 double pointed needle the same size or a little smaller for applied border. Crochet hooks: US F (3.75) mm or larger for provisional cast on; US 13 (0.85 mm) or size that fits through bead. Beads: 437 [667, 822] count (12 [18, 22] grams) size 8/0 seed beads. Finished size: 12.25 x 67 [22.5 x 67, 26 x 74] inches. Thanks to TNNA for letting me share this snippet of the January 2011 fashion show in Long Beach that features this design. If you listen carefully you can hear the audience’s reaction twice: an “oooh” and sort of a collective gasp when the number of beads is mentioned.